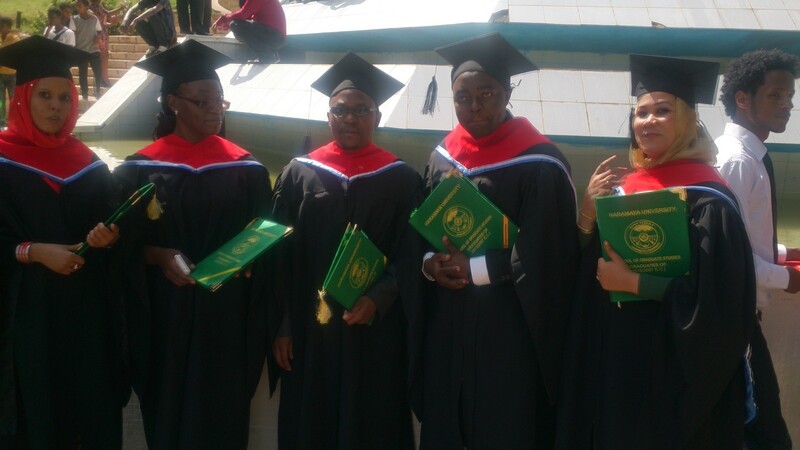 Above from left to right: SHARE Students: Hanaa (Sudan); Liambila (Kenya); Moffat (Zambia); Olivier (Burundi), Maysoon (Sudan) graduated on 04 July 2015 in Haramaya University, Ethiopia. RUFORUM has recently awarded 67 Field Attachment Program Award (FAPA) grants to her students totalling to US $84,000. The Field Attachment Program Award (FAPA) is one of the competitive grants program designed to provide graduate students supported by, and/ or associated with RUFORUM interventions at Member Universities to disseminate their research findings and recommendations to the communities where the research was undertaken through an internship arrangement that links them to community, industry, the private sector and policy and decision makers. By design, the field attachment awards are intended to encourage students to follow through with the dissemination of their research and enable them to link more closely with the agencies working in the area where their research was carried out. The current round of FAPAs went to students in various countries drawn from various RUFORUM Regional MSc. Programmes. Further, the grantees were also drawn from four RUFORUM Intra-ACP Academic Mobility affiliated projects. Of the 67 awards, 64 were awarded to students under the Intra-ACP Academic Mobility projects implemented by RUFORUM Member Universities. The coordinators to the four programs who will work as mentors to the students are: Prof. Dintwa Edward of University of Botswana (Research Funds for students under Mobility to Enhance Training of Engineering Graduates in Africa – (METEGA); Prof. Banadda Nobel of Makerere University (Research Funds for students under Mobility to Enhance Training of Engineering Graduates in Africa – (METEGA); Prof. Rubaihayo Patrick of Makerere University (Research funds for students under Inter-University Cooperation to Train Crop Scientists for African Agriculture (CSAA); and Assoc. Prof. Paul Kibwika of Makerere University (Research funds for students studying under Sharing Capacity to Build Capacity for Quality Graduate Training in Agriculture in African Universities). It is hoped that this award will propel the mobility students to share their experiences and publish their research for international audience. Five of the 64 awards are to students that have just recently graduated from the first intake of a RUFORUM incubated and piloted Programme – the Masters in Agrometeorology and Natural Risk Management at Haramaya University. The Haramaya University Graduation Ceremony held on 4th July, 2015 was presided over by His Excellence Prime Minister Hailemariam Desalegn of Ethiopia who also hooded and handed over Honorary Doctoral Degrees to His Excellence President Guelleh of Djibouti and Professor Gebisa Ejeta. The Other FAPA’s have gone to 3 students who have been engaged in two research teams in Uganda and Ethiopia. The two students in Uganda research focused on water balance studies in the Lake Victoria catchment area while the student in Ethiopia conducted his research on the Role of ICT in Utilization of Teff Technologies in Enebsie Sar Midir District, East Gojjam Zone, Ethiopia. Apart from the 67 FAPA awards, additional 6 FAPA awards have been made with support from International Crops Research Institute for the Semi-Arid Tropics (ICRISAT). See more on this: https://blog.ruforum.org/2015/06/25/ruforum-awards-six-grants-for-dryland-cereals-research/. The RUFORUM FAPA are implemented through an open call that allows students to submit their proposals and applications as and when they are about to or have completed thesis submission. FAPA applications are received on-line using the RUFORUM Information Management System (RIMS). The call can be accessed from the Field Attachment Program Award: Open Call for Proposal. Applicants should create an account in RIMS (http://rims.ruforum.org/contacts/register/) or to login if they have an existing account. Contact: Grants Management Unit: cgs@ruforum.org; Dr. Paul Nampala: p.nampala@ruforum.org; Dr. Anthony Egeru: a.egeru@ruforum.org; Mr. Henry Massa-Makuma: h.massa@ruforum.org.